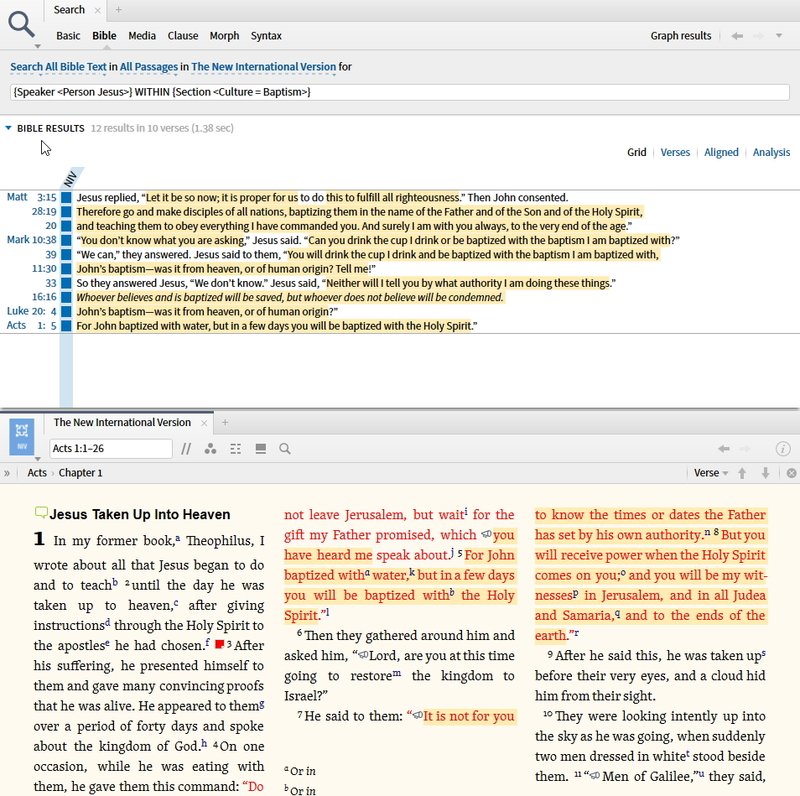 As some of you know I use Logos Bible Software extensively for personal devotions, sermon preparation, academic work and so on and for the last few weeks I have been working with the latest update to that software. It has a wide range of new and very useful features – if you would like an overview please see “What is Logos 6?” and “Logos 6 Features” – and in this post I wanted to share just a few aspects of what it can do. 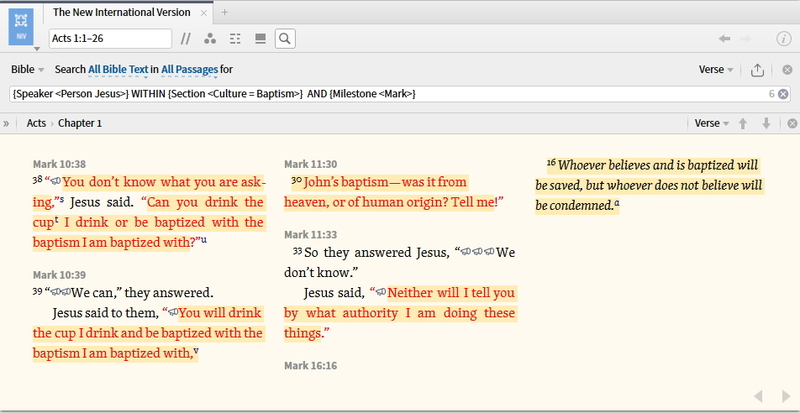 Recently in our church we have been looking at the topic of baptism and one of the very helpful things in this latest update is the idea of “Cultural Concepts” which provides tagging for many of the concepts which appear in the Bible. I can use this to search for places in the Bible where the concept of baptism is mentioned even if the word itself is not present in the verse. In the screenshot below, Matthew 3:15 is returned. Here Jesus and John the Baptist are speaking about baptism but the word isn’t actually used. 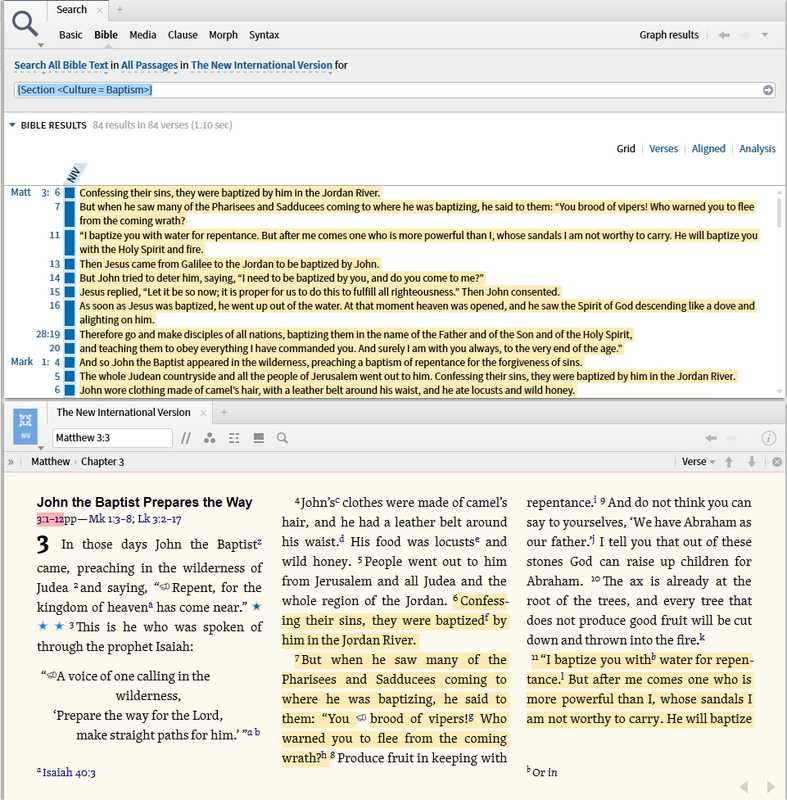 One of the additional bonuses, as you can see, is that the relevant passages are automatically highlighted in the Bible as well making it easy to scan them. So this makes it easy to find everywhere this concept is referenced. And if I wanted to refine it even further I could limit the search to a particular Gospel (or other passage range). While not necessary here as there are a just a few results to look at, the functionality is useful. This capability makes looking up these types of sophisticated searches very easy and flexible. This makes it possible to look at just the relevant passage ranges together which is very powerful. There is much, much more in this latest update to help people study the Bible which, from my perspective, has to be a good thing.